Course Description: This course provides opportunities for students to communicate and interact in French in structured situations, with a focus on everyday topics, and to apply their knowledge of French in everyday situations. 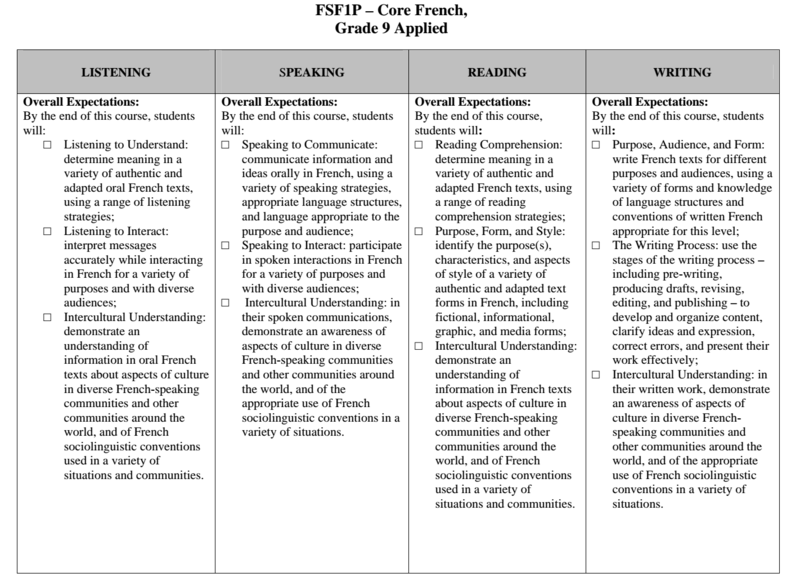 Students will develop listening, speaking, reading, and writing skills introduced in the elementary Core French program, through practical applications and concrete examples, and will use creative and critical thinking skills in various ways. They will also enhance their understanding and appreciation of diverse French-speaking communities, and will develop skills necessary for lifelong language learning. An introductory unit, students will read, watch and listen to several fictional stories. They will participate in discussions and debates with one another and reflect upon the stories studied. In this unit, students will use qualifying adjectives, write descriptive paragraphs, and study reflexive verbs. Students will learn about the passé composé of regular and irregular verbs, personal, direct and indirect object pronouns, as well as the pronouns y and en. Students will learn futur simple and participate in a novel study. Students will learn about different cultures around the world and research and complete a brochure and oral presentation about their own culture of choice. The final evaluation consists of listening, speaking, reading and writing. A different format is used for the listening and speaking components than the reading and writing. The listening and speaking are interactive with the teacher while the reading and writing is a proctored 2 hour written exam. Together these final assessment tasks constitute 30% of the student’s final mark.